Every little girl I know wanted to be a little hero. They intend to imitate to save the world just as their hero movie does. Little girls Lets go save the world! Minnie mouse and bee hats for little girls. Can be props for a newborn baby girls. That’s right, crochet is one of the top trends for this Summer 2016. It was all over the catwalks of fashion week and every clothes shop on the high-street will be full with crochet goodness, whether it be necklaces, shorts, rompers or a sassy bikini. 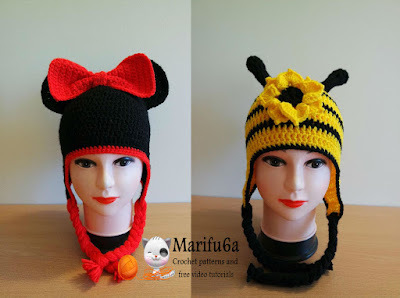 If you’re a crocheter, chances are you’ll be thinking – “I can make those”! And yes, you can! This top is created with simple square crochet patterns. These large motifs, worked in a summer-weight cotton, are perfect for your summer wardrobe. This easy top with a complimentary or contrasting tank and spice up your favorite pair of jeans. You'll also discover how to join crochet squares as you go, for easy finishing.